Last year one of the items for the dance concert was Goldilocks and the Three Elves. Some of the Elf costumes were able to be re-used from a previous concert but a few pieces needed to be made. 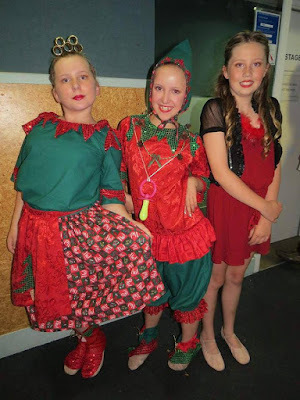 I based the blouse on the loose fitting B style as although it was to be tucked into the skirt Miss Lisa wanted it loose and over the hips under the skirt so it wouldn't ride up out of the skirt partway through the dance! Marking the hemline on the pattern tissue. I then carefully folded the tissue up and marked it with tailor's chalk. I didn't want to cut the pattern tissue . . . never know when you might need it again! So I traced the armhole edge I wanted off the pattern and used this piece to mark the armhole on the fabric. Cutting the trim for the neckline of the blouse. I cut all the angles one way then went back and cut the other side of the triangles! Attaching the self-fabric bias binding I made, which I later inserted elastic into. The trim for the sleeves. The skirt was a simple one. Two rectangles gathered onto the waistband at the front and straight stitched to the back waistband which then had elastic inserted into it. Here I'm stitching the back waistband down. Baby Elf had a top but I needed to add a ruffle to it to make it longer. Baby Elf also needed pantaloon type pants so I used the above pattern for those. They needed to be a bit baggy, have a ruffle and be elasticated to keep them up above Baby Elf's knees. Stitching the lace to the edge of the pants. Just above is the casing for the elastic, which will run through binding stitched on the inside of the main fabric. Baby Elf also needed an elvish type bonnet so I had a look online and chose this pattern as it is designed for an older child who has a larger head. It was a great pattern to make up. I slightly elongated the back seam to give a longer peak.There are many patterns on the web but the majority are for toddlers or younger children. There needed to be a trim around the outside of the bonnet. To make it sturdy enough and for depth of colour I used a double layer of the sequin fabric. I made a small template and stitched around it until I had enough pieces. The triangle is taller than its base hence my "edge ↑ " to make sure they were all the same! I then cut them out close to the stitching. The trim stitched to the edge before I lined the bonnet, then added binding of the same fabric as Mama Bear's skirt. Above are Mama Bear's boots on Goldilocks. These were made out of a snakeskin look vinyl type fabric. Easier to sew than I thought they would be. I had fun figuring out the pattern for these. They needed to be put on quickly so the laces are actually gold elastic, hat elastic thickness, so that there is some stretch for the opening. Mama Bear and Baby Bear backstage with Goldilocks. I was able to find a co-ordinating red fabric for the frill on Baby Elf's top to go with the original fabric. The only thing I had to make for Papa Elf were the boots! 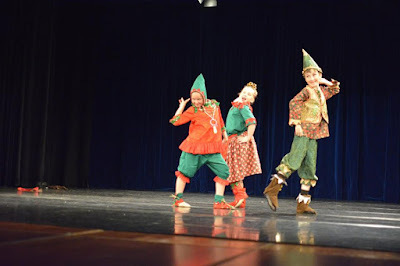 Here are Mama, Baby and Papa Elf rocking their stuff on stage. They had a lot of fun with this ballet.